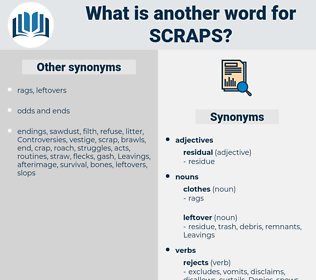 What is another word for scraps? scrapings, discards, parcels, Artefacts, retrenchments, shards, pieces, fractions, parings, collapses, shreds, motherfuckers, fragments, excerpts, residues, relics, traces, mouthpieces, restaurants, clippings, remnants, clasts, cutouts, Tailings, reductions, slabs, strips, tatters, haircuts, suckers, landfills, shortfalls, slices, flakes, crumbs, cuttings, Tracks, portions, Culls, chutes, tricks, wrecks, drops, declines, LUMPS, cutbacks, breaks, waterfalls, bits, cutoffs, strands, hints, solids, plots, chunks, goodies, cubes, ends, tips, edges, ies, lengths, songs, tunes, cuts, leftovers, remains, falls, parts. Absurd, yes; but it all acquired a curiously disturbing significance on the day when Maguennoc was able to compare the scraps of prophecy engraved on the dolmen with the complete prophecy. Afterward followed scraps of the years at Gordon's Pride, and on top of them the talk with McAndrews. 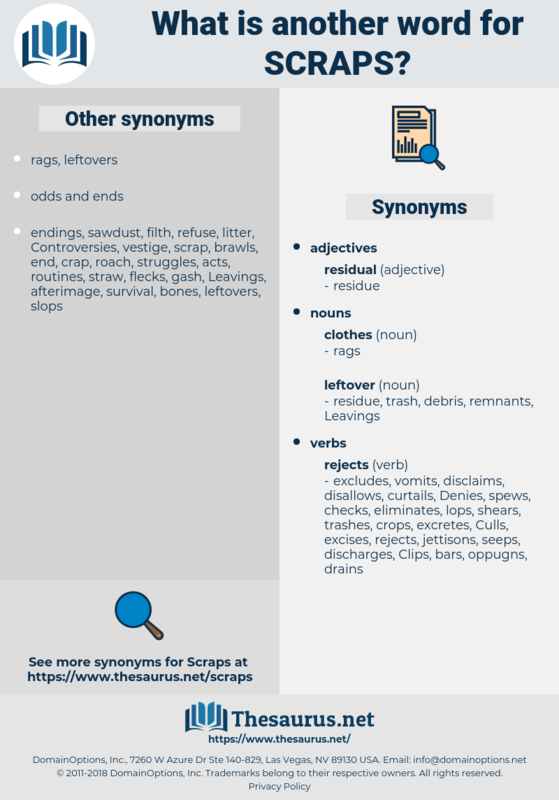 sourpuss, scorpius, scirpus, scripps, surf fish, scarface, seriphus, sour fig, Scire Facias, srbija, suckerfish, sorbus, seraphic, services, scarabaeus, surface, surbase, scrub oak, scrapbook, scrubs, sacrifice, service, sea crawfish, surface gauge, surffish, surface gage, surpass, sugar-bush.